The keyword in Mr. Toyota’s design philosophy is fluid dynamism, which in the application to the Jinji Lake Concert Hall means creating the seamless flow from music to architecture, using aesthetical elements of Suzhou as a kneading thread. The concept of dynamism comes from the Nineteenth Century German music theoretician Moritz Hauptmann’s classic treatise, “The Nature of Harmony and Meter”, in which he expostulated, “music is architecture in motion. The rippling edges of the tiled roofs, winding paths of beautiful stone pavement and the soft lines of the famous Suzhou silk are all elements of Suzhou’s landscape and heritage which will come into play with the music that will echo in these halls. The Jinji Lake Concert Hall is a gem within a gem. Situated within the renowned architect Paul Andreu’s Suzhou Culture and Arts Centre, the Jinji Lake Concert is designed and built specifically to be the home of the Suzhou Symphony Orchestra. Inaugurated on September 30, 2017, the concert hall is a project of architectural ingenuity and acoustical marvel. The internationally acclaimed acoustician Yasuhisa Toyota led his team of specialists who devoted their talents and expertise to this project of restructuring the current exhibition hall in the Suzhou Culture and Arts Centre and building in its place a brand new structure that will occupy an area of 6,000 square meters and an acoustical volume of 8,000 cubic meters. 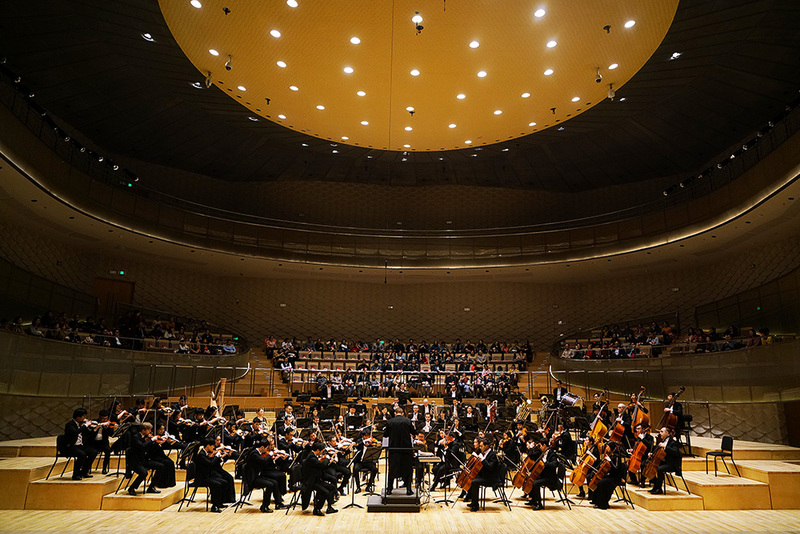 Mr. Toyota’s previous masterpieces of acoustical engineering have included the Suntory Hall, the Helsinki Music Center and the Elbe Philharmonic Hall in Hamburg. Upon its completion the Jinji Lake Concert Hall will join that distinguished list of the most state-of-the-art concert venues in the world. The Jinji Lakel Concert Hall is built in the place of what was previously an exhibition hall, a brand new structure occupying an area of 6,000 square meters and an acoustical volume of 8,000 cubic meters, the North Wing utilizes the existing curved double walls, which will both serve the acoustics and provide a fluid space for the concert hall. Optimizing the irregular shape of the hall, the design will minimize the distance between the artists and the audience using his signature “surround style”. The 500-seat audience seating area surrounds the stage, which at full capacity can accommodate a 120-member orchestra, creating immediacy and intimacy on one hand, versatility and flexibility on another. The South Wing takes advantage of the regular shape in the current space to provide a designated area as the office for the orchestra. Three clearly defined spaces for rehearsals and performance, for educational and related activities and for administration exist harmoniously in the concert hall. The contemporary, world-class design will flow into the public area of the Suzhou Culture and Arts Centre, where using a variety of media and creative programming, the audience can have an interactive experience with music and with the orchestra, promoting further SZSO’s brand image.